The Applied Physics Research Group is committed to engaging with members of the public and the wider scientific community. 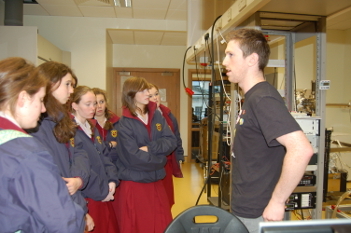 Members of the APRG regularly participate in outreach events, such as tours of our facilities, open days, Nano Week and exhibitions such as the B.T. Young Scientist & Technology Exhibition. In 2014, Prof. Shvets initiated a unique, innovative programme to promote Science, Technology, Engineering and Mathematics among secondary school students. Based in the TCD School of Physics, The Walton Club, offers an informal but structured platform where students are taught by researchers and PhD students to think critically about science. The concept of the Walton Club has been lauded both in Ireland and abroad as an effective instrument to promote STEM as part of the school curriculum. This year we have had over 400 students going through the club. They come for weekend classes each Saturday and during School breaks. Current and past members of the group, including , have participated in teaching at the Walton Club.